GoPro Hero 7 Black Has Killer Stabilization but Same fps! GoPro has released 3 new cameras including the Hero 7 Black which is now the flagship product for the company. The key feature is HyperSmooth which is a predictive stabilization technology based on scene analysis and sensor telemetry to accurately anticipate motion and correct the image to generate a gimbal-like smooth appearance to the video. 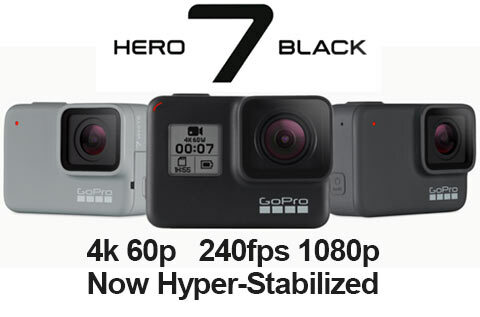 When you see the footage it is clear it is a huge improvement compared to even the Hero 6 Black which had a pretty good stabilizer. Insta360 Pro 2 Can do 120fps at 4k! We liked the Insta360 Pro released last year because it upped the ante in resolution and immersion compared to other off the shelf camera solutions. This new Pro 2 camera essentially increases the performance by stitching six 4k images to truly bring VR recording to a point where resolution blends with realism at 8k 3D. VR has always suffered from the resolution Achilles heel which can kill the experience as you notice image errors like aliasing, softness or stitching artifacts. Slow Motion Tutorial for Premiere Pro CC by Becki and Chris! Ever wondered how to use slow-motion footage effectively with Premiere Pro CC from Adobe’s Creative Cloud? This quick tutorial by YouTubers Becki and Chris will go through the basics of capturing, editing and organizing the footage for a consistent workflow. They used cameras like the GoPro Hero 5 Black, Sony a7s II, and the DJI Osmo to capture the footage.